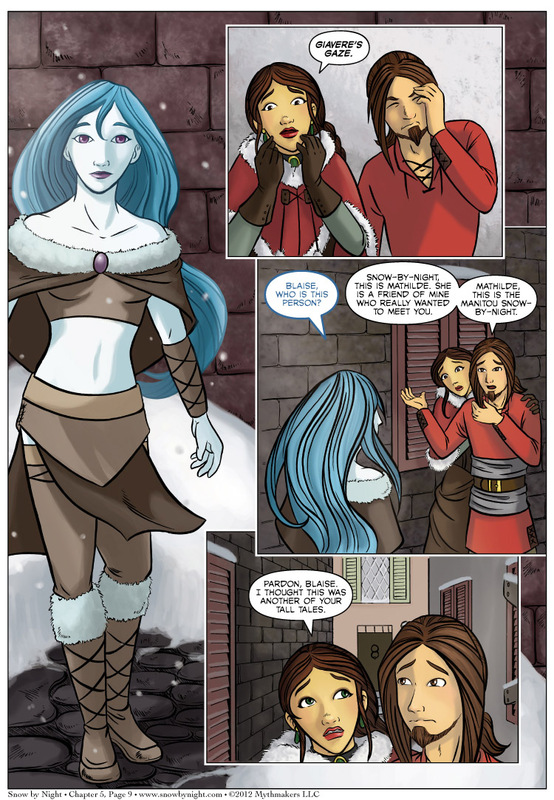 Mathilde and Snow-by-Night meet on Chapter 5 Page 9. This is the manitou’s first meeting with someone other than Blaise and Jassart, and this could go poorly for all involved. If you want to see how much snow it takes for Snow-by-Night to form her body, please vote for Snow by Night on Top Web Comic. It’s a busy couple of weeks for me. My thanks to Naty for covering the journal on Monday. I’ll probably be asking Diane to cover Friday’s journal as Brittany and I are headed to Intervention this weekend! This delightful convention makes up in awesomeness what it lacks in size. It’s a treat to meet a lot of other creators and they will be there in spades. If you are in the Washington, DC area, I recommend you stop by. I also have a couple interviews that are up. The first is for Greyhawkery, a blog for the World of Greyhawk and all things Dungeons & Dragons. I’m a huge RPG geek, running games and even freelancing for WotC, and Greyhawk is one of my favorite worlds. Mort cast me into the Ring of Five Questions and dared me to write my way out. In addition, Brian James and I were interviewed by Byron and Liz of Rho Pi Gamma. Brian and I wrote the book Menzoberranzan: City of Intrigue together. We had a great time chatting up a storm with the two, all while I tried to derail Byron’s agenda for the podcast. Liz is also the creator of another fine webcomic Adrastus. Ah, so Snow can’t actually hear through her eye-amethysts. That’s REALLY good to know! Also, “eye-ethysts” is how I’ll always think of them now. What a LOVELY first panel. I love how the lines aren’t black as she has not materialized yet. Very nice! I can’t wait for more!